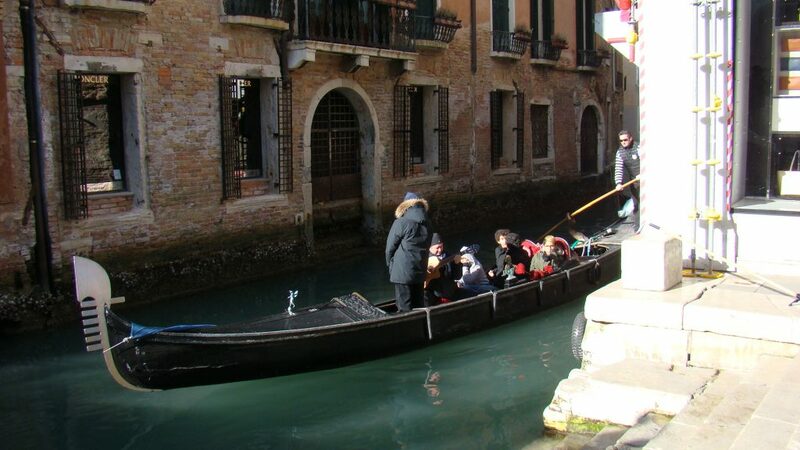 To break up our cold, dreary winter we decided to go on a little 3 night trip to Venice. I have been five times before but never in the winter. Everyone says it’s better in winter because it doesn’t smell. I say, balderdash! 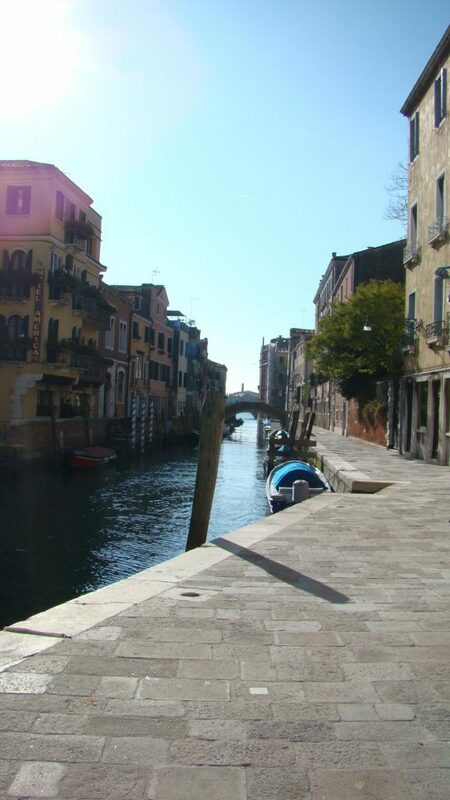 I have been in hot June and never ever picked up any odor from the canals. A bum wrap for sure. We took the regional train from nearby Terontola to Florence. There we got the fast Frecciarosa train. It has 4 classes of travel. We opted for Business, one step down from top. It was a lovely quiet trip as no one was in our entire car but us! Arrived in 3.5 hours. Low stress. 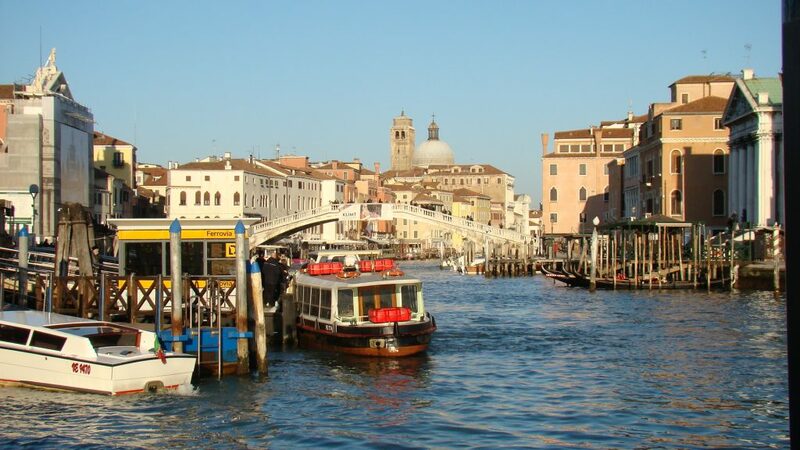 We arrived in Venice around 3:30 PM and took the Vaporetto number 1 which goes all the way down the Grand Canal. Here’s the bustling Grand Canal at the train station. We got off at Ca’ Rezzonico. This we were told to do by the people we rented our flat from. Julia, a nice college student, met us there and showed us the way. And then she showed us around the apartment. It was a one bedroom, living room, kitchen and bath. Nice enough if a bit dark. There were only two windows and the Living Room had no window at all. Kind of cave-like. 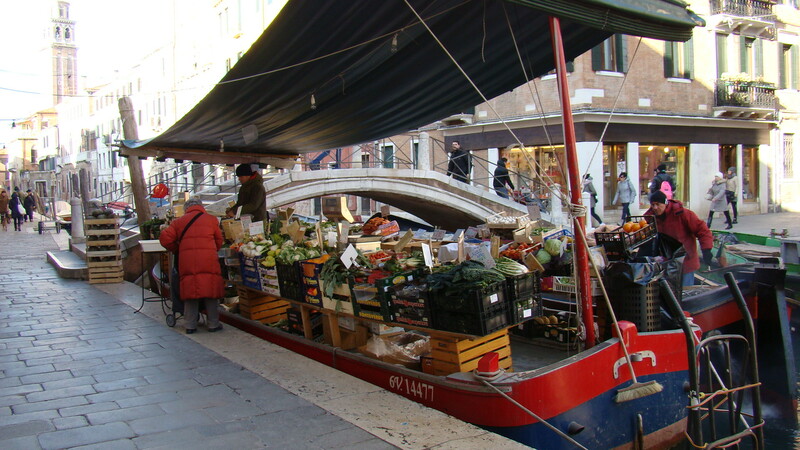 It was, however, in our neighborhood of choice, the Dorsoduro. Our neighborhood. Loved this yellow building. 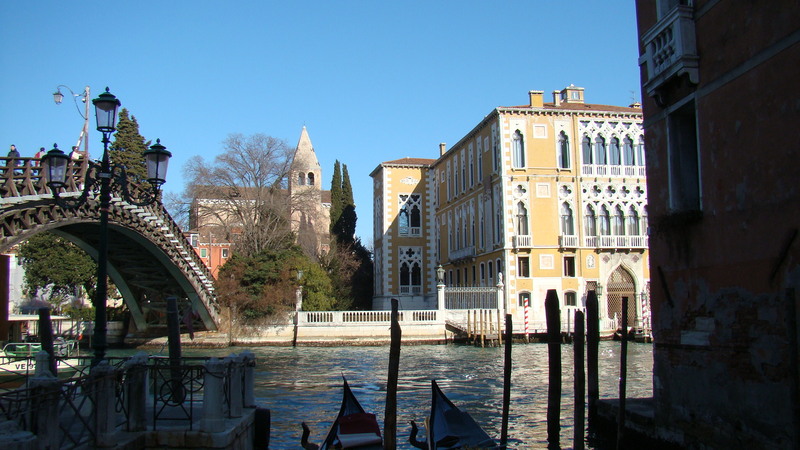 During our trip we visited the Peggy Guggenheim museum mainly to see the Tancredi Parmegiani exhibit. He was an abstract artist from about 1946-1964. Amazing works and very diverse. He became a protege of Peggy Guggenheim. She probably made his career. He was very talented…and troubled. He committed suicide in 1964. We also visited the Accademia Museo. It was full of many religious paintings plus some non-secular works to include a small exhibit of Hieronymous Bosch. Here are some of the sights along the way. Our efforts to find good food were thwarted several times. The first dinner, we tried to go to a place advertised as open…but they were on winter vacation. A hazard when traveling in the winter I guess. We settled on a place nearby which was average at best. 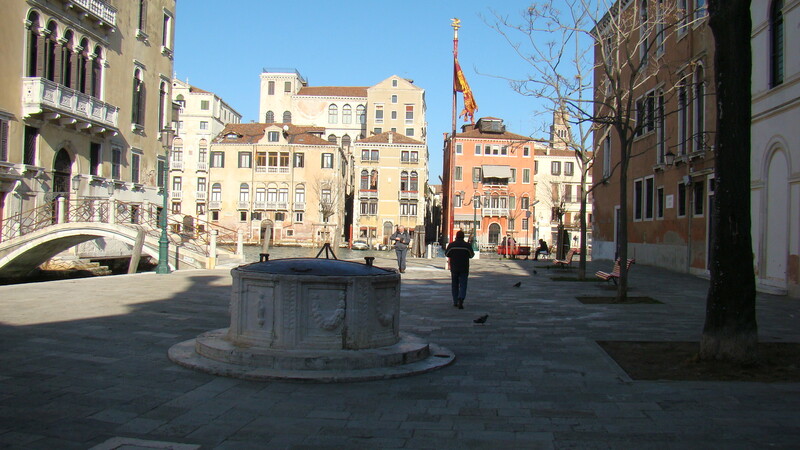 Next day we tried to go the Ennotecca San Marco and they were closed for renovation. Drat. 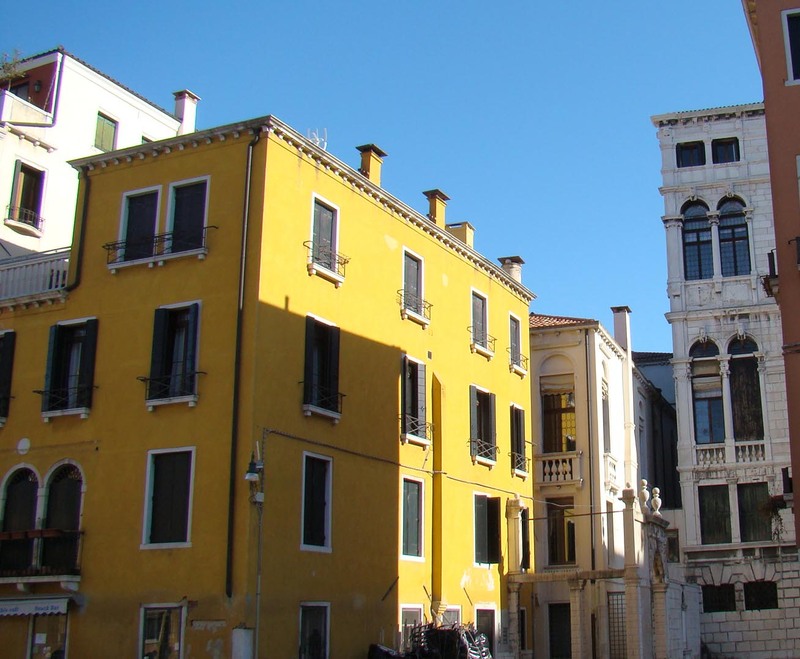 We ended up near La Fenice at a place called Vino Vino. We figured it would be bad but it was quite nice with nice servers and decent food and wine. Here’s the interior. Early brothel decor. That evening we got lucky and got in one of our choices, Estro Vino e Cucina. Quite good wine bar with food. And on the last day we had a wonderful time meeting with our friend Jed and his husband Simone who live in nearby Treviso. We had a lovely dinner at Anice Stellato, their recommendation. Fun to see them. Our weather was sunny all the way through. It was pretty cold though. Blustery sometimes, but in the sun it was pleasant. Some cold, looking tourists on a Gondola ride. This entry was posted in Eating, Travel, Trip Report on January 31, 2017 by Nancy Hampton. 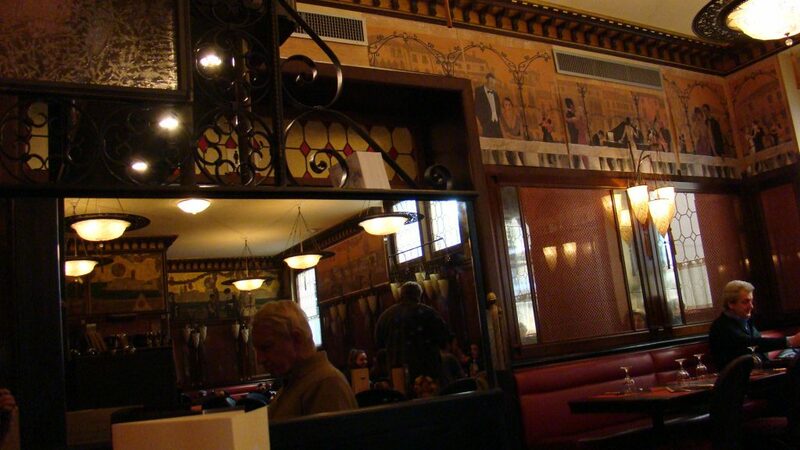 Yesterday we went out for Sunday lunch, an important part of an Italian week. We have been trying a few new restaurants that I read about in a magazine article in a Perugia magazine. Yesterday we tried one called La Forchetta Bistro in the small town of Ponte San Giovanni south of us. There are scores of little towns between Umbertide and Perugia but we always just go speeding past on the E45 heading to somewhere else. The little town is on the main TrenItalia train line and has an old covered type bridge over the Tiber. It was our first visit to La Forchetta Bistro. We opted to try out the tasting menu at 40€ a person. This included four courses plus dessert. The dining room is bright and sunny with very high ceilings partly divided by a high brick arch. The two people serving us were perfect. Friendly, helpful and the pacing was perfect. Here are some pictures of our amazing food. 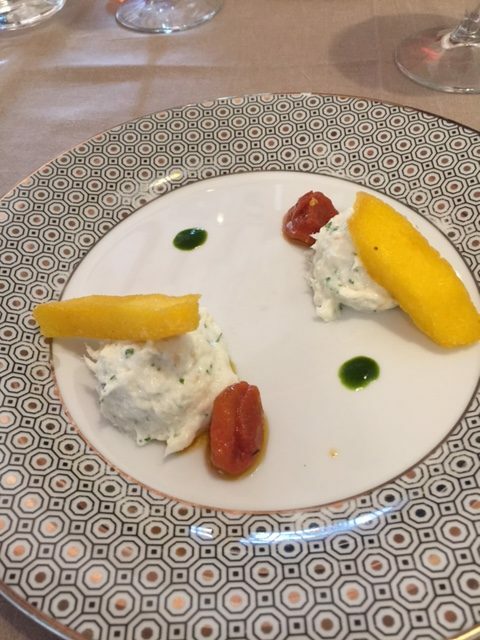 Bacala mousse with fried polenta and carmelized tomato coulis. Bacala is a local specialty made from dried salt cod. 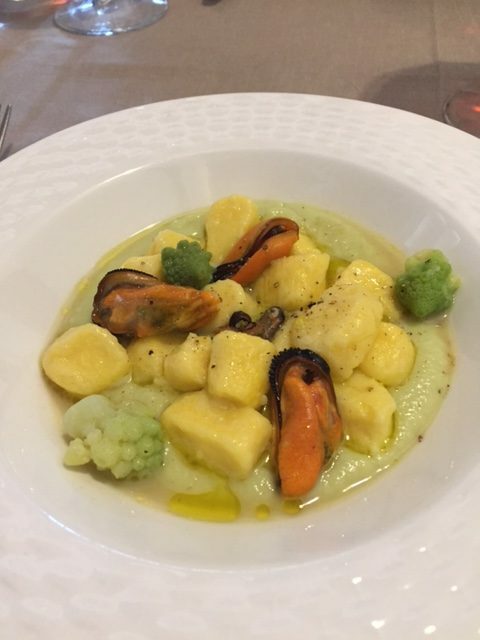 Gnocchi over broccoli purée, with mussels and bits of steamed broccoli. This was the most filling dish. 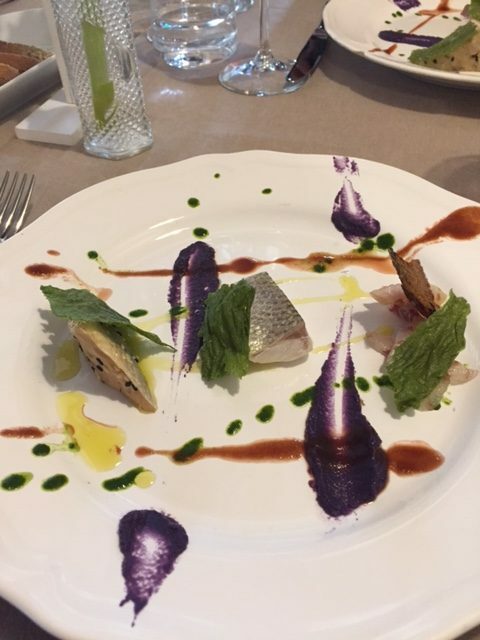 Marinated trout served like a Picasso painting with schmears of puréed red cabbage, something orange and dots of green and olive oil. Oh and crunchy fried spinach. Finally there were five desserts. 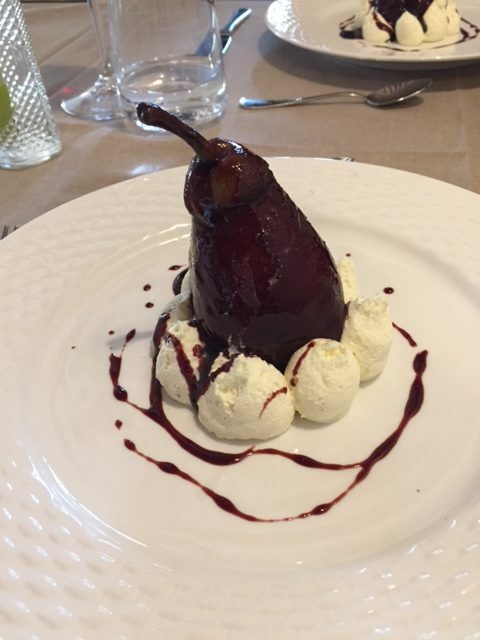 We got pears poached in red wine surrounded by chantilly cream and drizzled with chocolate syrup. Divine. As you can see all of the presentations were beautiful. It was a surprise in such a small little village and well worth a special trip. 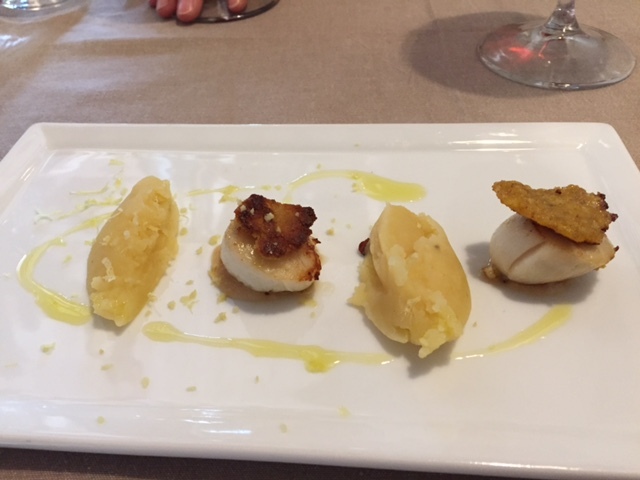 This entry was posted in Eating, everyday life in Umbria, restaurants, Umbria on January 23, 2017 by Nancy Hampton. Winter here in Italy has been brutal so far. Friend in Abruzzo, next region to us, had 3 feet of snow! 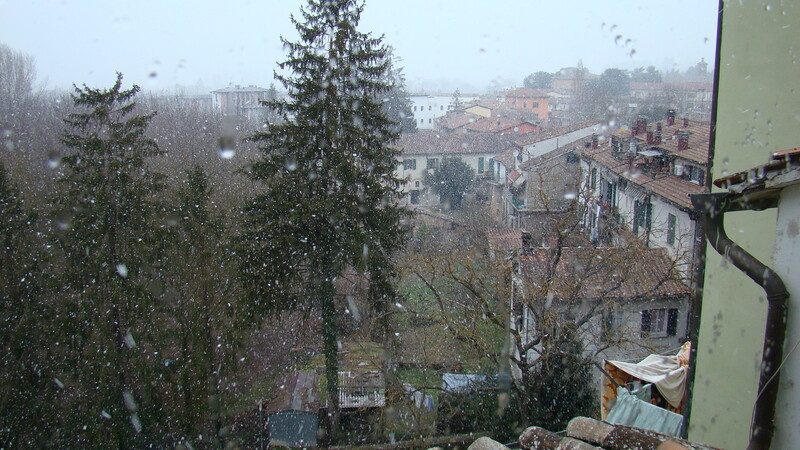 Other friends way down south in Basilicata and Campagna are also slammed with frozen water pipes and lots of snow. Yesterday earthquakes south of us triggered a tragic avalanche in Abruzzo which completely buried a hotel. 4 dead and 27 missing so far. We felt the quakes here but they were not strong. There were 10 quakes in the last 24 hours. We have had our first snow. It was only a dusting but probably the most I’ve seen here since we came. I heard it was much worse up in the hills surrounding us. Still it was pretty. Montone is the hill town nearby. This is the mountain upon which it sits. 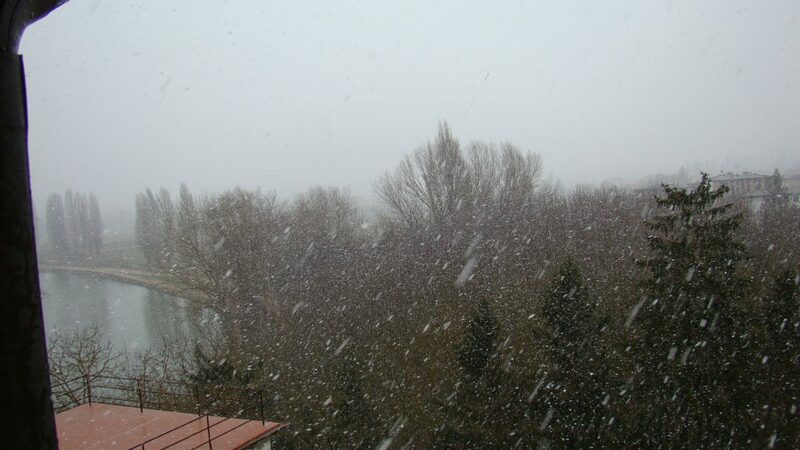 It was snowing so the view is softened. Luther wanted a steak yesterday. Cuts here are very different from the US but this one is familiar. Here it is called a Contrafiletto. 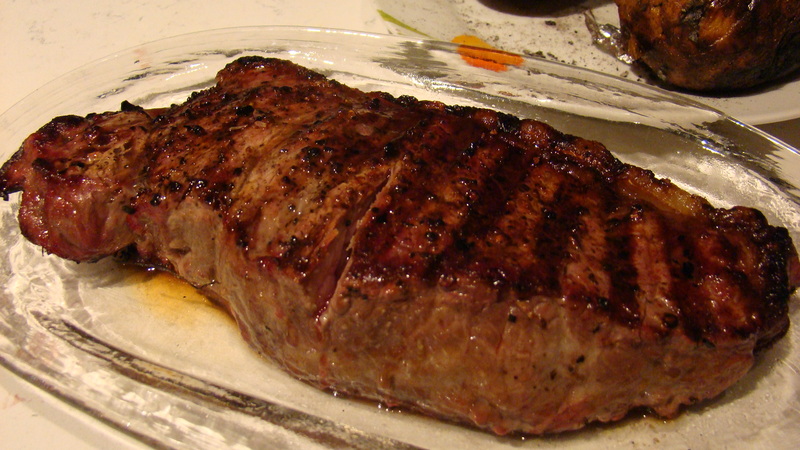 In the US it is a ribeye. Ready to grill! The fire was welcome in more ways that one. It warmed my frigid kitchen up and I sat close by to enjoy the warmth. 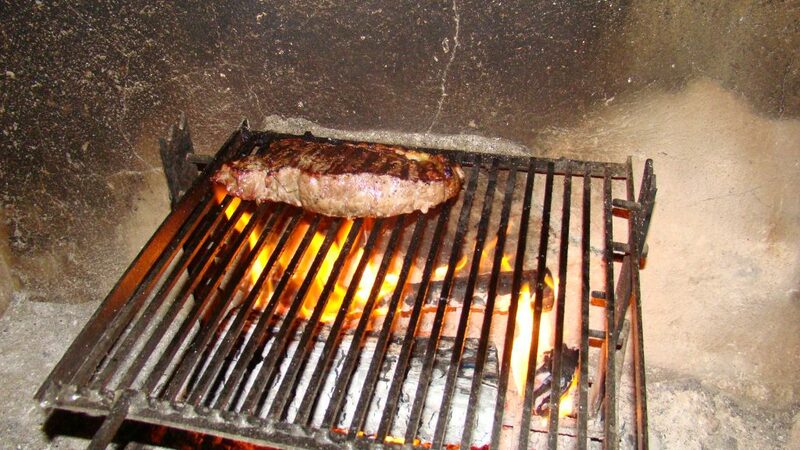 It also cooked our dinner of steak and two potatoes wrapped in foil and embedded in the coals. Finished product. It was pretty good. They don’t finish beef on grain here so it is not as marbled. Hence it is not as tender. Good flavor though. This entry was posted in cooking, Eating, everyday life in Umbria, Umbertide, Umbria on January 19, 2017 by Nancy Hampton. Here in Umbertide we also celebrate Befana, the Christmas witch. Amusingly, she arrives in an Ape, a three wheel truck-type vehicle. She distributes candy! I took her photo and she gave me candy! I must have been good this year. Here she is! In Italian folklore she is thought to have originated in central Italy near where we live. 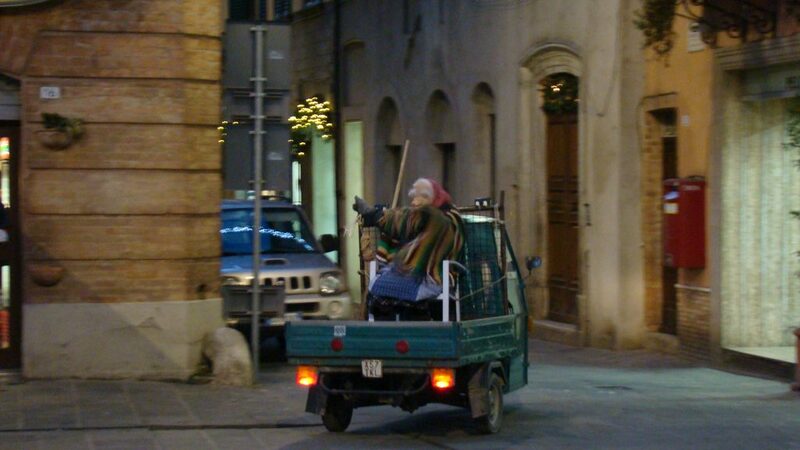 Befana is an old woman who delivers gifts to children throughout Italy on Epiphany Eve (the night of January 5) in a similar way to St Nicholas or Santa Claus. Since before Babbo Natale arrived on the scene, Italian children have been celebrating the annual visit of La Befana. Befana is said to visit all the children of Italy on the eve of the Feast of the Epiphany to fill their socks with candy and presents if they are good, or a lump of coal or dark candy if they are bad. The child’s family typically leaves a small glass of wine and a plate with a few morsels of food, often regional or local, for the Befana. She is usually portrayed as a hag riding a broomstick through the air wearing a black shawl and is covered in soot because she enters the children’s houses through the chimney. According to legend Befana was approached by the biblical magi, also known as the Three Wise Men (or the three kings) a few days before the birth of the Infant Jesus. They asked for directions to where the Christ child was, as they had seen his star in the sky, but she did not know. She provided them with shelter for a night. The magi invited her to join them on the journey to find the baby Jesus, but she said no, that she was too busy with her housework and sweeping up. Later, la Befana had a change of heart, and she tried to search out the location of the baby Jesus. That night she was not able to find them, so forever after, la Befana has been flying over the grapevines and olive trees searching for the little baby and leaving children candy in hopes the Christ child is there. There are many different versions of this legend to this day, some darker than the above. One tells that la Befana was mother to a child that died, and she went mad with grief. When Jesus was born, she sought him out. She thought that he was her child. She eventually met Jesus and presented him with gifts to make him happy. The infant Jesus was delighted, and he gave la Befana a gift in return; she would be the mother of every child in Italy. 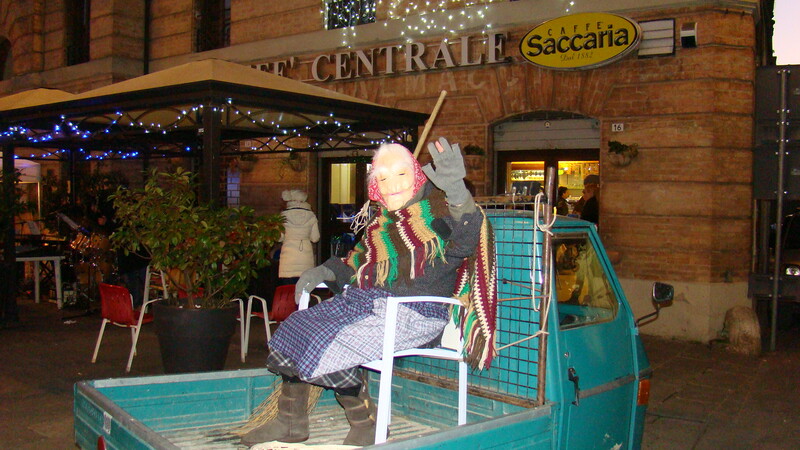 Now la Befana is celebrated throughout all of Italy, and she has become a national icon. In the regions of the Marches, Umbria and Latium, her figure is associated with the Papal States, where the Epiphany held the most importance. 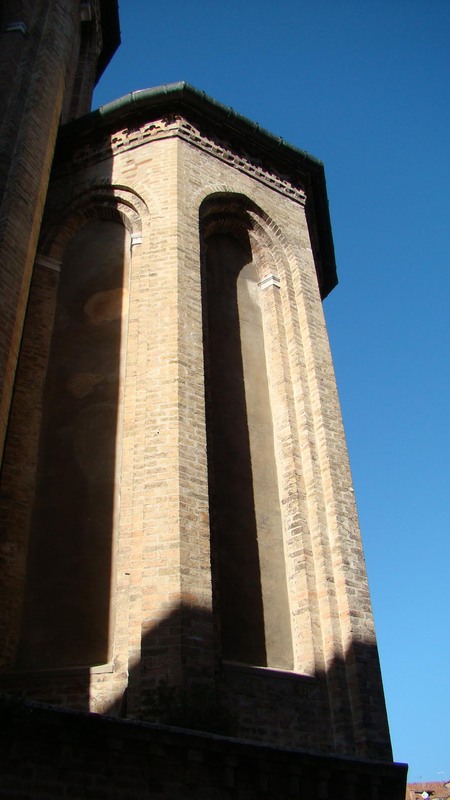 You can find images of la Befana all through Italy. She is not romanticized, she is an ugly hag with missing teeth and a torn dress holding a broom with a crazy grin on her face. I guess Italians don’t want to make their hag a prettier, more acceptable figure. They like her just as she is. A very Italian attitude! 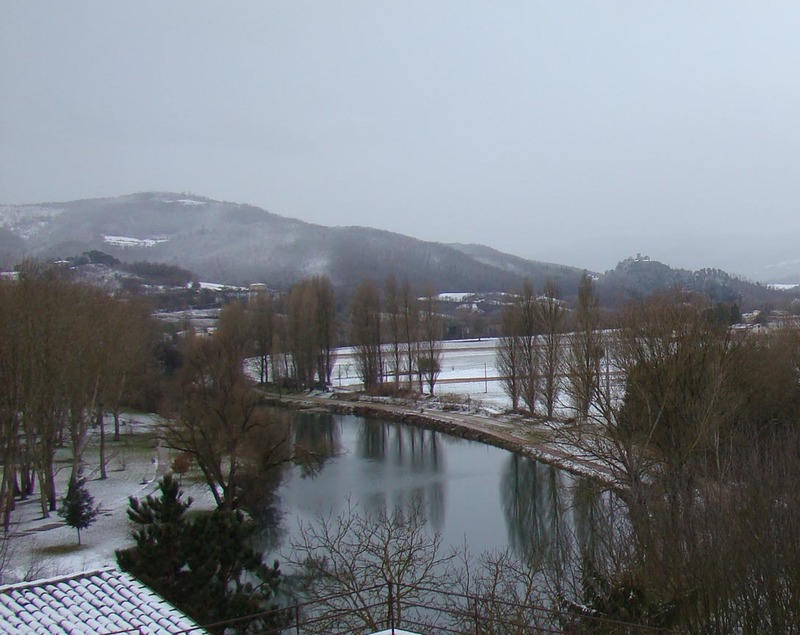 Neve e gelo e tramontana! In snow and frost and the north wind! 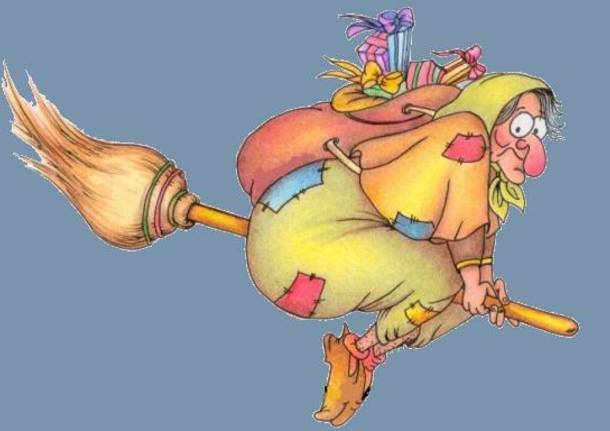 Here comes, here comes the Befana! Once the song is over, all the children open their eyes, and check their shoes. Whoever finds the candy that the “Befana” has hidden there wins! This entry was posted in everyday life in Umbria, Festivals and Sagras, Umbertide, Umbria, Uncategorized on January 6, 2017 by Nancy Hampton. 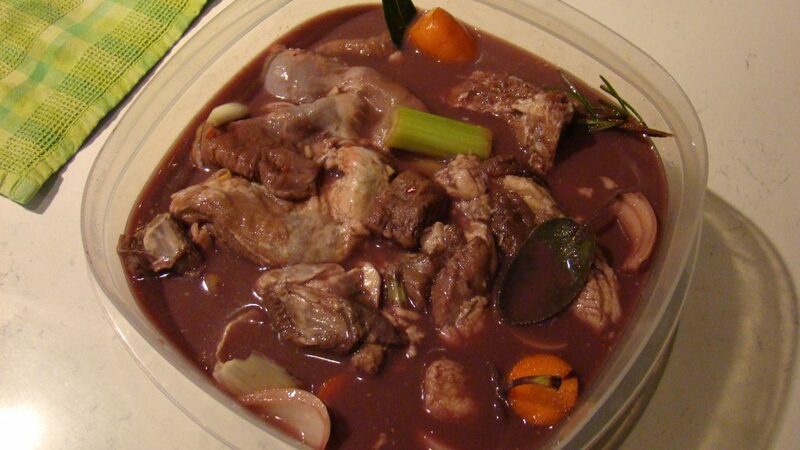 OKAY for all you folks waiting with bated breath for the results of my Cinghale stew (wild boar stew) here are two pictures. First is the boar after marinating for 2 days in red wine plus other stuff. This is the final product which we ate last night. It was surprisingly yummy. I don’t own a crockpot but I looked up how to emulate it. It said to cook in an 200F oven for 6 hours, covered tightly. This worked well. The meat was tender and falling apart. Juniper berries, whole (to taste); approx. 1 Tbsp. Red chili pepper flakes (to taste); approx. 1-2 tsp. Drain the meat and vegetables, reserving the liquid. Chop the vegetables into smaller pieces and sauté them in 5 Tbsp. olive oil for several minutes, preferably in an enameled, cast iron casserole or any heavy stew pot. Remove. Now add the wild boar meat to the pot, salt and pepper it, and brown the meat in the oil in batches. Return the vegetables to the pot. Add one soup spoon of the wine; let it evaporate at high flame. Now add the reserved marinade liquid, the tomato sauce or puree and bring to a boil; Cover tightly with a lid and foil to keep in the moisture. Put in a 100C/200F oven for six hours. This emulates a crockpot. If you have a crockpot then you can use that. 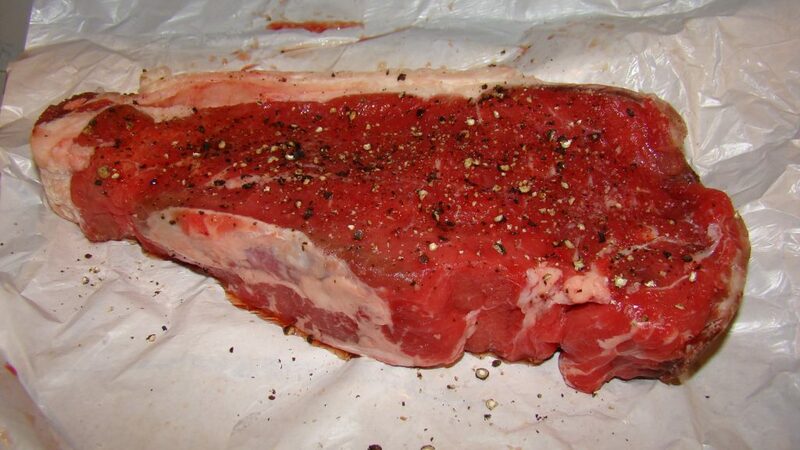 The meat should be melt-in-your-mouth tender when done. 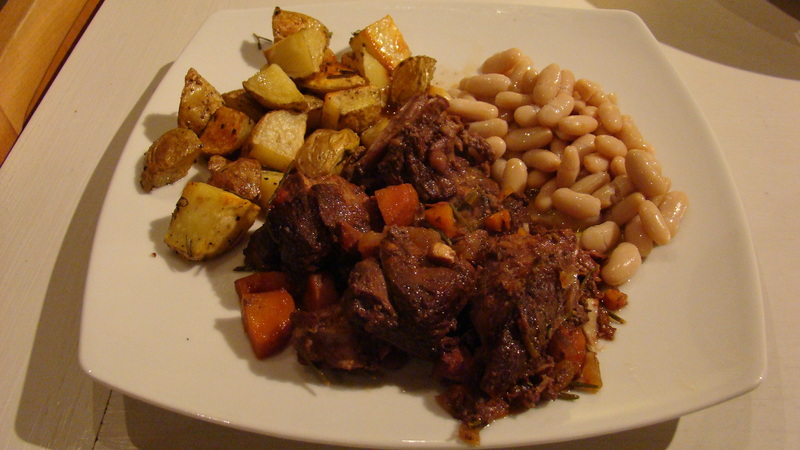 Delicious with roast potatoes and cannellini beans (white beans). This entry was posted in cooking, Eating, everyday life in Umbria, Umbertide, Umbria on January 2, 2017 by Nancy Hampton.